Don’t buy with your eyes! Farm raised salmon lack the natural ‘salmony’ color of wild salmon. They are white. Here’s the kicker… since salmon farmers believe consumers buy with their eyes (meaning that we look for the pinkest, “healthiest” looking filet), they use a DYE to give their ghostly fish a natural salmon color. 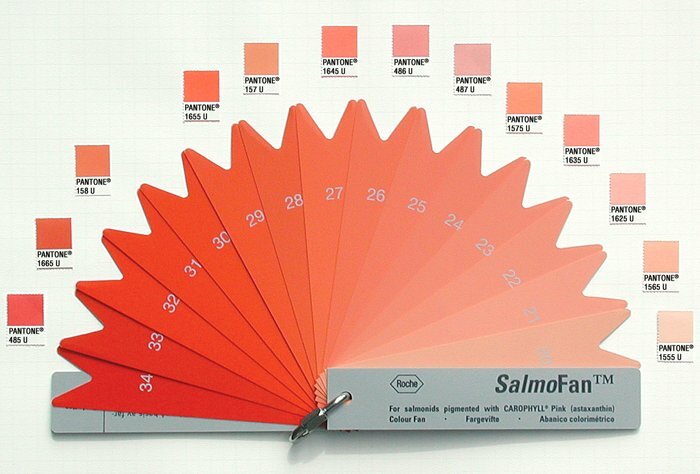 Farmers literally look at swatches (think paint samples) and pick out which color they’d like their fish to be. That’s another manufactured chemical (called canthaxanthin to be exact…in addition to the pesticides and antibiotics) that you are ingesting. Next time you are buying salmon, look for the words “color added” on the farm raised salmon; it will be labeled. Then, do yourself (and your family) a favor and ask for the WILD salmon. PS- I’m not made of money and I know that wild salmon is pricier (sometimes significantly) than wild caught. Look for specials, or look in the frozen section. I’ve found great deals before on flash frozen wild salmon. It keeps for a long time, and just defrost when you want it! (Secret… the stuff in the glass cases… most of it used to be frozen anyways… the store just defrosts it for you). So now I have a question for you… does this change your opinion at all on whether or not you’ll buy wild or farm raised fish? Why or why not? « Why am I eating? Very informative article. For those of us who do not have access to a variety of organic products (usually can get celery, but not apples, strawberries, bell peppers), is it better to eat non organic or skip all together? Only wild fish for me now! Loved the article. I had heard about the food coloring and antibiotics..it’s scarey what most food companies try to pull over on us. Thanks for the great information!